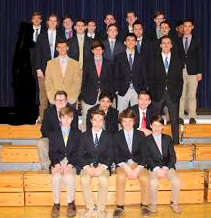 One of the most popular and beneficial clubs at Oratory is our St. Philip Neri Club. This is the club dedicated to having its members follow the path of St. Philip Neri and become leaders in the world. This could be through the mandatory attendance of daily mass at least twice a month or the projects conducted by the club that the club is known best for. The St. Philip Neri Club has had many ongoing projects through the years but here is what they are doing right now. The St. Philip Neri Club is always trying to raise money for any cause whether it is helping homeless people in towns like Summit or Morristown or donating money to help stop the inhumane action of human trafficking. Money is raised by students selling chocolate during CWP and paying five dollars to dress down for a Tag day. All together the Saint Philip Neri Club was able to raise over $1000 to donate to Catholic Relief Services. Currently, they have been donating Bro-Care packages to OP Brothers who have become sick during the school year or injured while playing sports. These packages include an Oratory bear and bar of chocolate. The main current project is for the Leukemia and Lymphoma Society or LLS. Now, each member of the club is getting a bag of about 10 bracelets to sell for donations that will all go towards LLS. Another group will go around during CWP and sell the bracelets to Oratory Students. Next up is a service drive for Cystic Fibrosis but that is still in the planning phase. All in all, here at Oratory we are all very proud of the work that the St. Philip Neri Club has been able to accomplish and hope that they will continue to make a difference in our school, towns, and world.